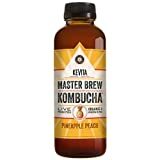 Kevita Master Brew Kombucha is a fermented tea beverage that contains live probiotics. Kevita is a brand owned by PepsiCo. 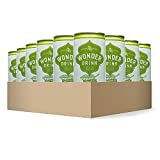 Master Brew has more caffeine than traditional kombucha because they also add green tea extract to their recipe. All flavors have the same caffeine amount per bottle. Sugar content: 15 grams (per 15.2 ounces). 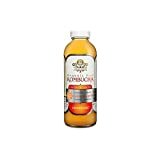 Master Brew Kombucha contains 5.00 mgs of caffeine per fluid ounce (16.91mg/100 ml).